Little Rock LeBron James is a standup guy, and one heckuva ball player. The other day as the World Champion Cleveland Cavaliers traveled to play the New York Knicks, he claimed he wasn’t making a political statement, but exercising personal preference ,and declined to stay in a Trump branded hotel. Most of his teammates followed him, though they all came on the same bus to Madison Square Garden. These Trumpster hotels, even ones where he is no longer getting any moola, like the one most of the Cavaliers declined to sleep in, are no doubt items of curiosity, as people try to get a grip on some kind of touchstones that might help understand the incoming president, but undoubtedly there will be many that decline to stay at his hotels, eat in his restaurants, or golf on his fairways, personal preferences and the American way of low-threshold silent, personal protests being common for many. On the other hand, ethicists and virtually all of the former Republican and Democratic ethics lawyers employed at the White House note that many, including foreign governments and corporations by the legions will flock to stay at Trump branded hotels, particularly the new hotel in Washington, DC, in hopes of currying even the least favor. To the degree such birds of a feather do come together, it is easy to imagine that these properties may become the playground and business watering and resting holes for countless minions of the right. Whether it’s a real boycott or a LeBron-style “personal preference,” he and many others can now also add to that list resisting a Hardee’s roast beef or a Carl’s, Jr. burger, and start covering their eyes every time one of the new Secretary of Labor’s salaciously politically incorrect hottie commercials airs with one of his juicy offering. Forget about watching the fantasy matches of the World Wrestling Federation as well. Likely the list will grow. Meanwhile, the hater-baiters over at Breitbart.com are mad as always at the top of their lungs and calling for various corporate boycotts by their alt-right, mad dog website base. Corporate boycotts and rightwing conservatives? Yes, it doesn’t sound right, but that’s what Stephen Bannon’s boys are up to over at his old job, before he became the Trump whisperer as his chief strategist. Here’s the Breitbart beef. A bunch of straight-laced, big name, Brand A companies pulled their ads off of Brietbart.com once their big brass and their public relations folks started coming to grip with the corporate risks of being identified with a racist, misogynist, hater outfit bundled under the umbrella of the alt-right. Though the Brietbarters would have you believe they are all about free enterprise, they don’t like it when it’s not going their way, so they have declared various boycotts to try and bully the ad money back into their pockets. Their current target is Kellogg’s. Not surprising with its big consumer footprint. They have big boycott signs on their website with pictures of boxes of cornflakes. But what’s the message? GMO/s? Nutrition? Calories? Hardly! Whining about losing money, oh, no, they can’t go there with their base and disclose the real facts. Instead they drag up fake news attacks they have generated about the Kellogg Foundation and claims of the terrible grants it has made supposedly to George Soros and the Tides Foundation, based in San Francisco. Really, grants to Soros who has his own foundation from his mega-billions? And, Tides because they funded progressive environmental, community, and human rights causes for the last 40 years almost? Executives at Kellogg’s are probably worried more about the latest weather report in Michigan than they are about any Brietbart bully boycott. And, sadly, as Trump continues to court his base, he probably cares less about LeBron’s personal preferences or any of the rest of our concerns, though his daughter’s brand and sales have reportedly been impacted in places like New York City. Nonetheless, we all have to do what we can, and maybe boycotts are coming back as weapons for progressives, and even for conservatives who have usually shunned them. 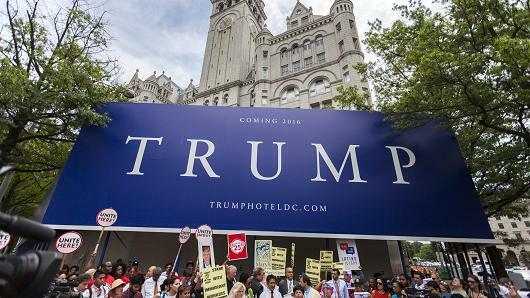 This entry was posted in DC Politics, National Politics and tagged boycotts, LeBron James, Trump Administration, Trump Hotels by Wade. Bookmark the permalink.